Calling remote services which runs on JLupin Platform can be done using two main protocol types: NATIVE and HTTP. Both of them are translated into proper JAVA objects and passed into method invocation. NATIVE communication uses JLupin Remote Method Call interface and is performed through built-in JLupin's Software Load Balancers. JLupinProxyObjectProducer exposes produceObject methods which returns object implementing remote service interface. Their constructors and methods are described in JLupin Javadoc section. But every proxy object producers required JLupinDelegator which is responsible for actual executing request on proper server. 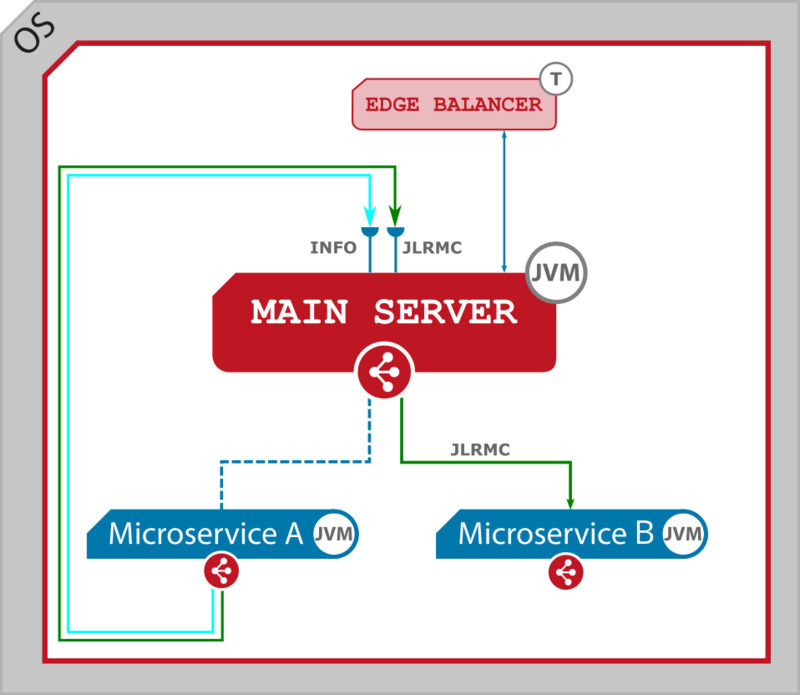 JLupin delegators have built-in software load balancers. Proper delegator can be created with JLupinClientUtil class. 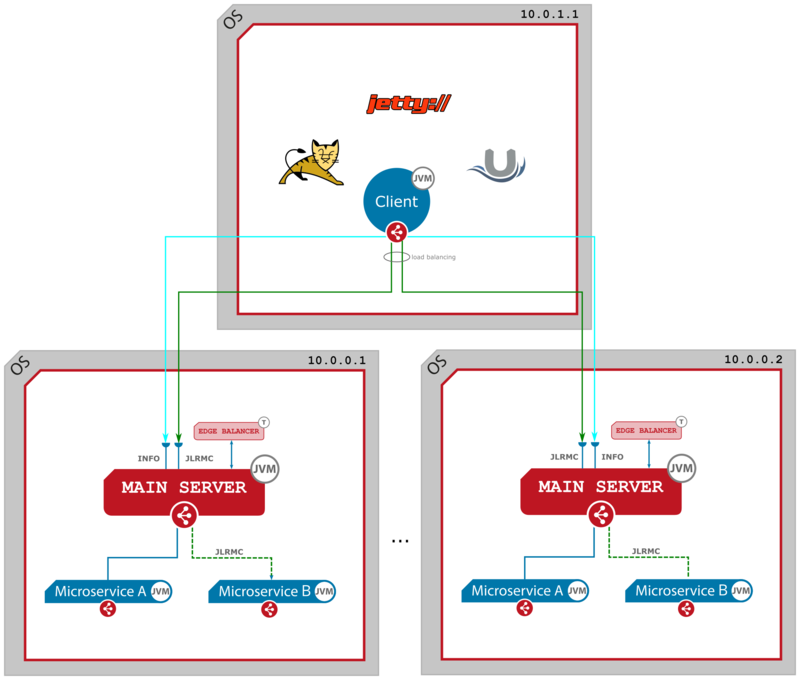 There are two load balancer types: - INNER_MICROSERVICE for communication between JLupin microservices - OUTER_CLIENT for communication between external clients (Tomcat, Jetty, other Java application servers) and JLupin microservices. 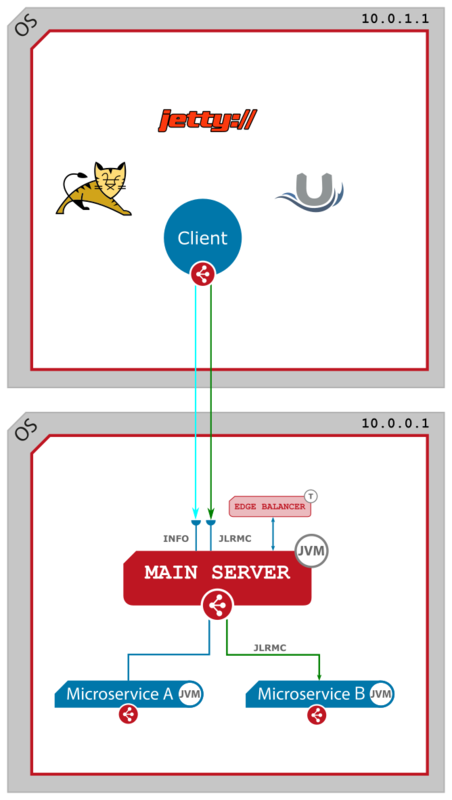 Inner microservice communication is defined as a communication between two microservices running on JLupin Platform (both are managed by Main Server). As you can see that call from "Microservice A" is load balanced to proper instance of "Microservice B". JLupin Platform automatically updates microservice's service repository (you can read more about service repository here). When call is executed load balancer checks it service repository and decide where to make the request through JLRMC port. To enable such communication, first you must create JLupinDelegator. Let's see how it works in code. Inside "Microservice A" you should create one JLupinDelegator and share it with other objects (like for example proxy objects). And that is all. When you call remote method by an interface, built-in JLupin's load balancer is being used in background to find proper microservice and execute your request. Good practice is to configure JLupinDelegator as an internal bean. Every remote service should also be configured as a bean. It will be easier for example to change local service to a remote proxy. As you can see that call from "WebApp1" is load balanced to proper instance of "Microservice B". JLupin Platform automatically updates microservice's service repository (you can read more about service repository here). When call is executed load balancer checks it service repository and decide where to make the request through JLRMC port. To enable such communication, first you must create JLupinDelegator. Inside "WebApp1" you should create one JLupinDelegator and share it with other objects (like for example proxy objects). Outer client type is reserved for external access for microservices running on different infrastructure. For outer client servers list must be provided. This is because load balancers need to know where to connect (where to ask if microservice is available). IMPORTANT: Remember to call method start() on JLupinDelegator on start up to turn on internal load balancer thread. If you forget about it load balancer won't know where to route your executions. Also remember to call method stop() on JLupinDelegator and JLupinClientUtil.closeResources() method when closing your application. Good practice is to configure JLupinDelegator as an internal bean. Also every remote service should be configured as a bean. It will be easier for example to change local service to the remote proxy. HTTP communication to native microservices is performed through HTTP Elastic API, see this chapter to get more details. 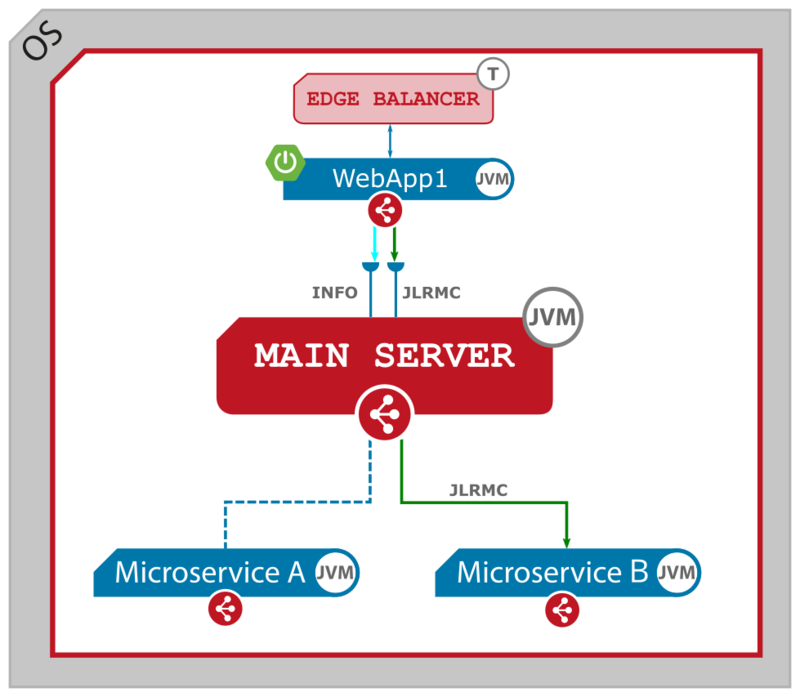 ELASTIC API as well as HTTP communication to servlet microservices (user defined API) is accessible through JLupin Edge Balance, see how it works.